The Magic Multiplier is putting on a show and he needs your help! Click here to play! Learn all of his magic tricks and you might find yourself conjuring up quite a bit of cash! First things first, you’re going to need to pick up a few tricks and there is no better teacher than the Magic Multiplier himself. Spin in two or more of this jolly magician as he not only holds the top payout of the game �' worth up to 10,000 times your line bet �' but he’s also a substitute that will fill in for most other symbols to help you bring in more wins. Next up, learns the slight of hand or how to saw your assistant in half as both of these symbols carry top payouts worth up to 250 times your triggering line bet if you can spin two or more across an active payline. Don’t forget your tools. Cards, top hats with wand, and bunnies all payout as well. There are a few major tricks you’ll need to learn if you want to be really successful. The first of which is the mesmerizing wheel trick. Spin two or more of this scatter symbol to multiply your total bet. Three or more will award free spins. Next up is the curtain feature. 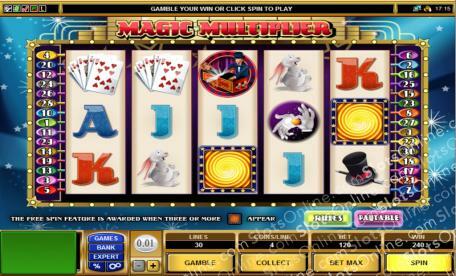 Spin the magic curtain on selected reels to trigger a bonus game. Finally, the cup and ball symbols will also trigger a bonus round if you can spin them on selected reels. See if you have what it takes to be the Magic Multiplier perform his spectacular magic show for a chance to spin in the biggest of wins. The mesmerizing spinning wheel is a scatter. Spin two or more anywhere on the board to multiply your total bet. Spin three or more to trigger a number of free spins. The Magic Multiplier Magician is a substitute. It will replace most other symbols, excluding bonus symbols, to help you bring in more wins. He will also payout up to 10,000 times the line bet. There are two different bonus games in this online slot. The first is triggered by spinning the curtain symbol on reels 2, 3, and 4 at the same time. During this game, you will get to choose from three curtains to reveal your bonus prize. If you're lucky, you may just reveal a second turn at picking an additional curtain. The second bonus game is triggered by the cup n' balls symbols on reels 3, 4, and 5. This bonus game has three rounds in which you will have to find the ball under the cups to win your bonus prizes.